Fig. 1. 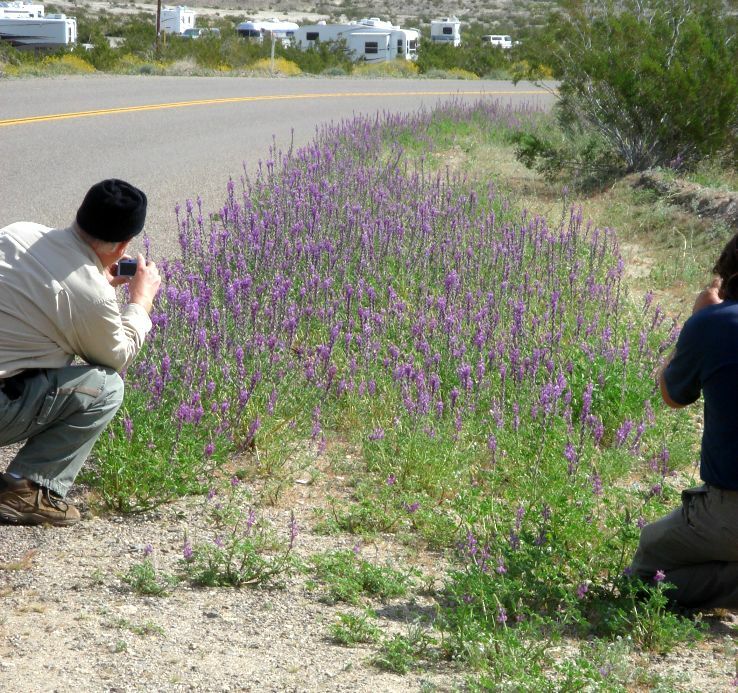 A time series of photographs showing the same field of Lupinus arizonicus, Arizona lupine, on the north side of S22 just east of the Arroyo Salado campground road. The field was photographed on four dates spanning 22 days from 27 January to 18 February 2019. The photos are not exact repeat photographs, especially the first one, but the others are close to the same view. 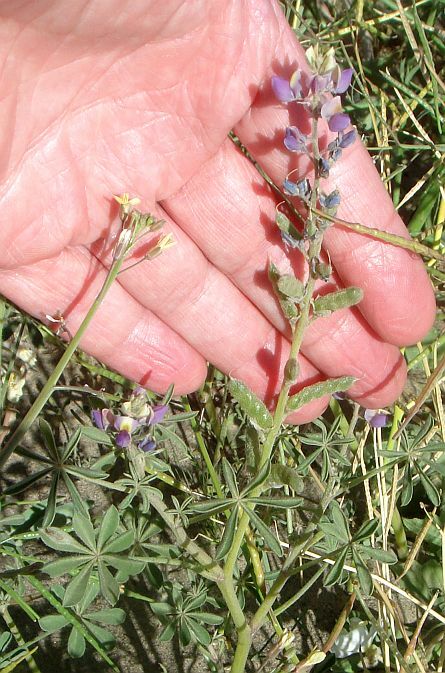 The first photograph shows that each plant has begun blooming with a single stalk. In subsequent photographs, additional stalks from each plant have come into bloom, while the first stalk elongates and continues to bloom. Some of the first stalks are on their last flowers in the last photograph; see the linked larger photo. This field began blooming around 20 January, about a week earlier than the first photographs here. Click on the photos for larger versions. 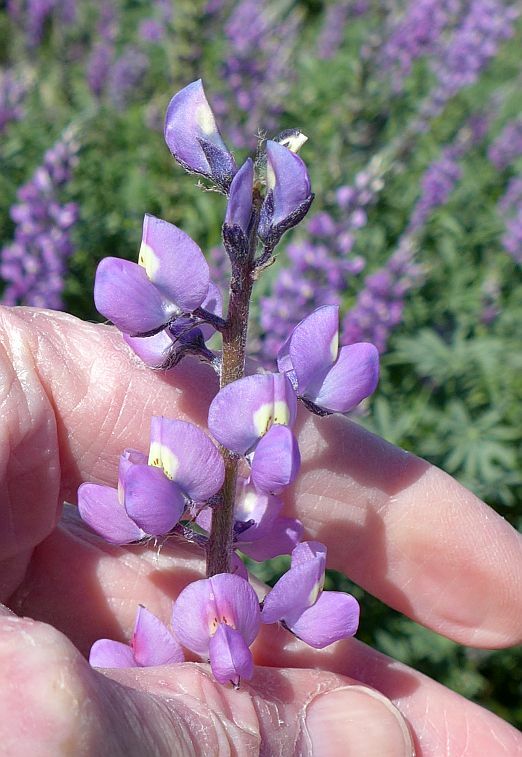 How Tall Can a Lupinus arizonicus Flowering Stalk Be? 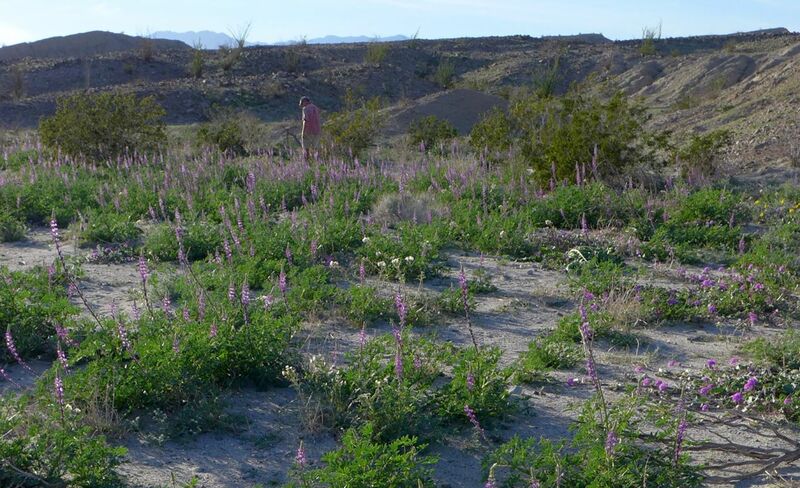 This page reports measurements made on some very tall L. arizonicus plants that germinated from mid-October rain in 2018, and began blooming much earlier than normal, in mid-January 2019. 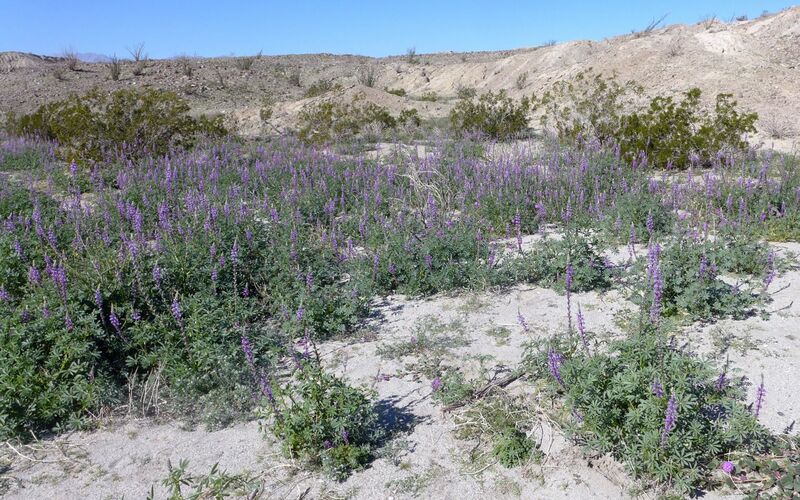 These plants were in an area where water ponds on the north side of S22, just east of the Arroyo Salado campground road. 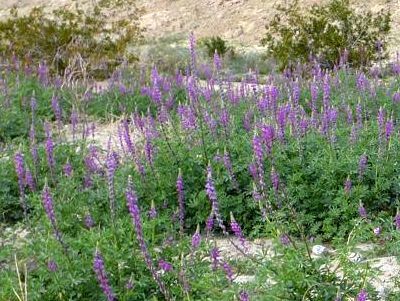 In most years, where desert rainfall first occurs in December to January, L. arizonicus does not begin blooming until mid-February, and stops blooming when the plants run out of water and have to concentrate on producing seeds before the spring heat fries the plants. As a result, those plants never reach their full potential. 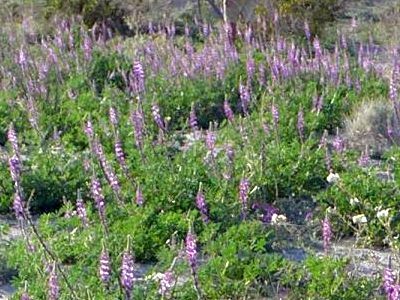 For example, the Jepson Manual gives the length of the inflorescence (the length of the flowering stem measured from the lowest flower to the topmost flower) as 4 to 24 cm (1.5 to 9.5 inches), which is probably the typical range in most years. 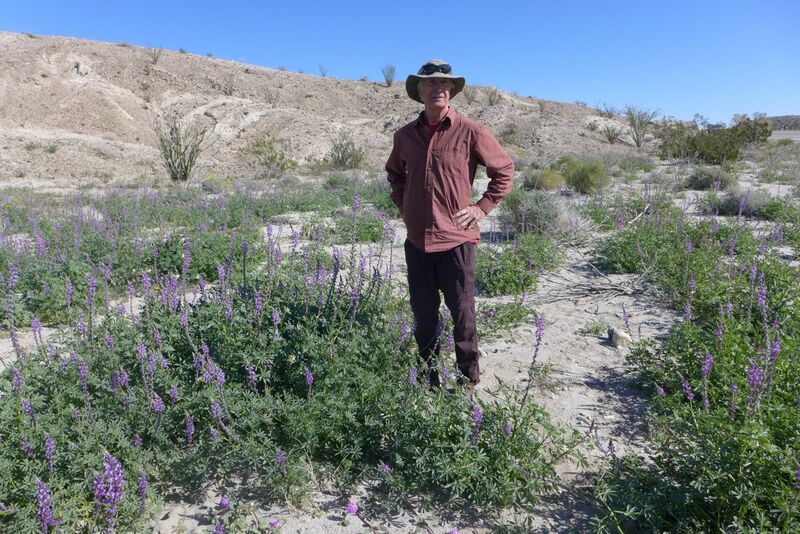 These 2018 to 2019 plants grew in optimal conditions, germinating in an area where water accumulated from a good rainstorm in mid-October, growing large, without blooming, in the Fall heat and abundant sunlight, and nourished by a series of further rainstorms from December through at least February. The temperatures were abnormally cool in January and February. So conditions were perfect for the plants to reach their full potential. When I first saw them, I wondered how long the flowering stalks could grow. 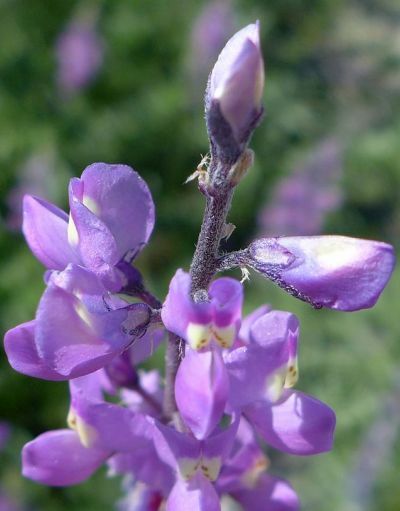 In particular, I wondered whether the stalks would be determinate, stopping at some pre-determined maximum length, or indeterminate, producing more flowers until the plant finally ran out of water, or the stalk snapped off from being too long. 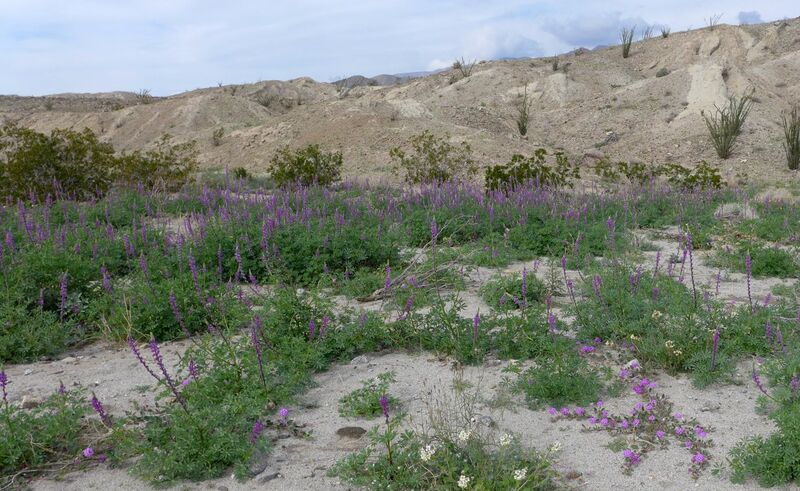 Severe winds are notorious in the Borrego Desert, and often are what destroys a good bloom. 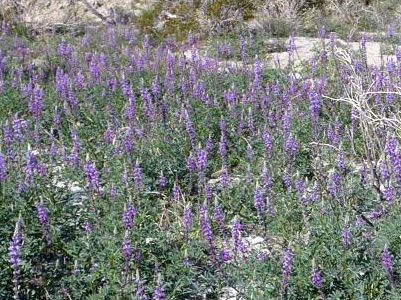 In fact, these plants were tested a number of times by strong winds, and survived. I decided to monitor the plants and measure the length of the inflorescence. I studied only the first flower stem produced on each plant. 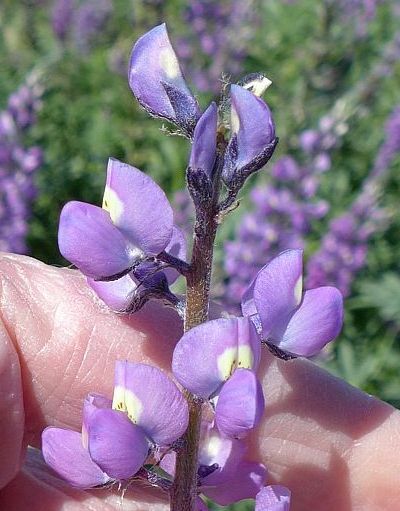 This species produces a primary inflorescence at the top of the main stem of the plant, and then, if resources are available, produces secondary inflorescences on branches from the main stem. 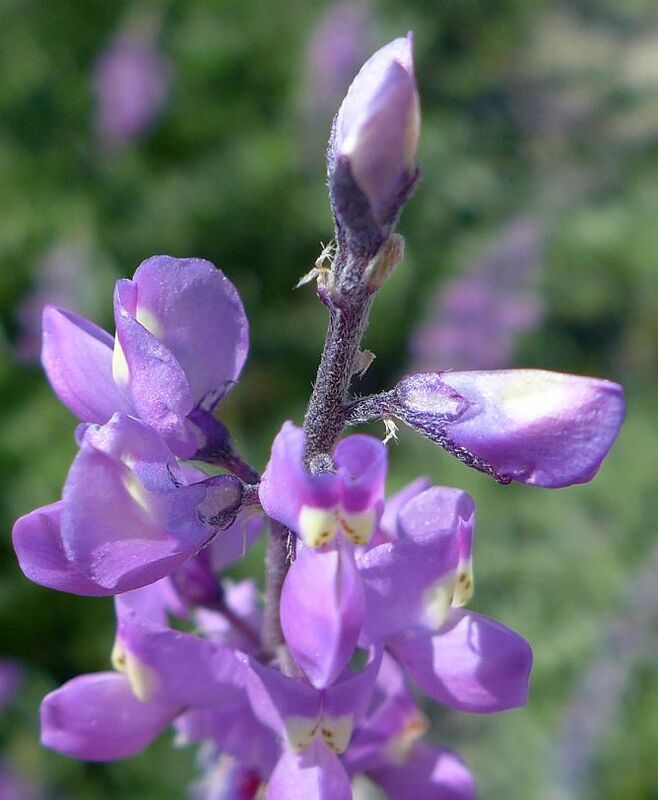 The primary inflorescence blooms first, beginning with flowers at its base. The number of flowers open at once increases until the lowermost flower is finished. 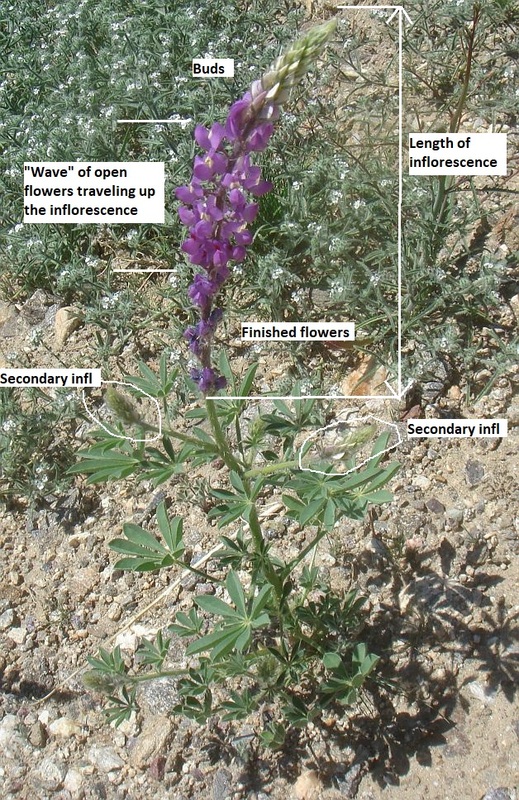 At that point, the number of open flowers is fairly constant, and the open flowers migrate up the inflorescence. See Fig. 2, and also the pictures linked in Fig. 1 for examples of inflorescences in various stages. Fig. 2. A plant with the main inflorescence in bloom, with developing secondary inflorescences, with labels for different parts of the inflorescence. I got the answer to my question fairly quickly, 22 days after first seeing these plants - the stalks are determinate. A handful of flowering stems had their last flower open, with no buds remaining on the stem; see Fig. 3. Fig. 3. The terminal end of the main inflorescence for two different plants, showing the last buds and flowers on each. Click on the photos for larger versions. The typical maximum inflorescence length for those flowering stems that had completed their growth was 30 to 34 inches (76 to 86 cm). This is 3.2 to 3.6 times the maximum inflorescence length given in the Jepson Manual! Fig. 4 shows the longest inflorescence measured on 7 February 2019, of 33 inches (84 cm), with 71.5 inch (182 cm) Don Rideout in the photograph for scale. 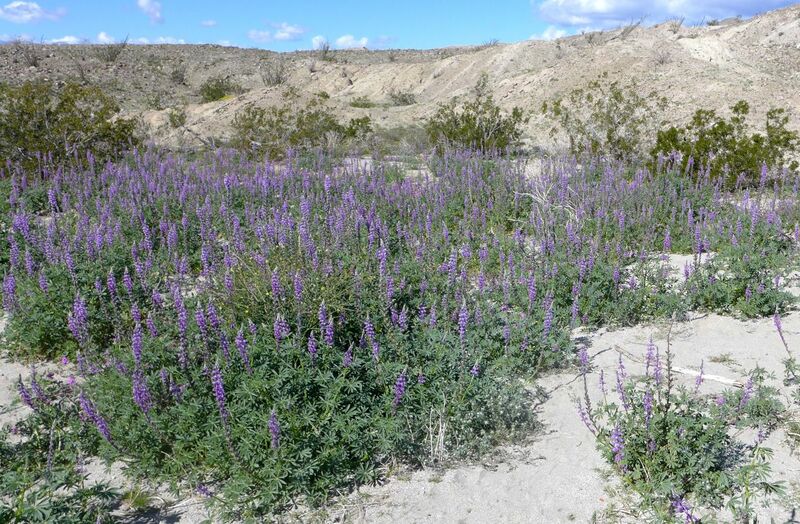 The insets show two stems from previous years, a 4 inch (10 cm) inflorescence that is typical of most years in most places, and a 12 inch (30 cm) inflorescence from the usually-good display on the south side of Henderson Canyon Road, just west of the Pegleg Monument, where runoff from the road ponds. 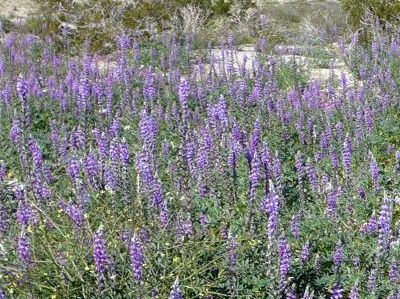 Those Henderson Canyon Road plants probably regularly exceed the maximum inflorescence length of 24 cm given in the Jepson Manual. Fig. 4. 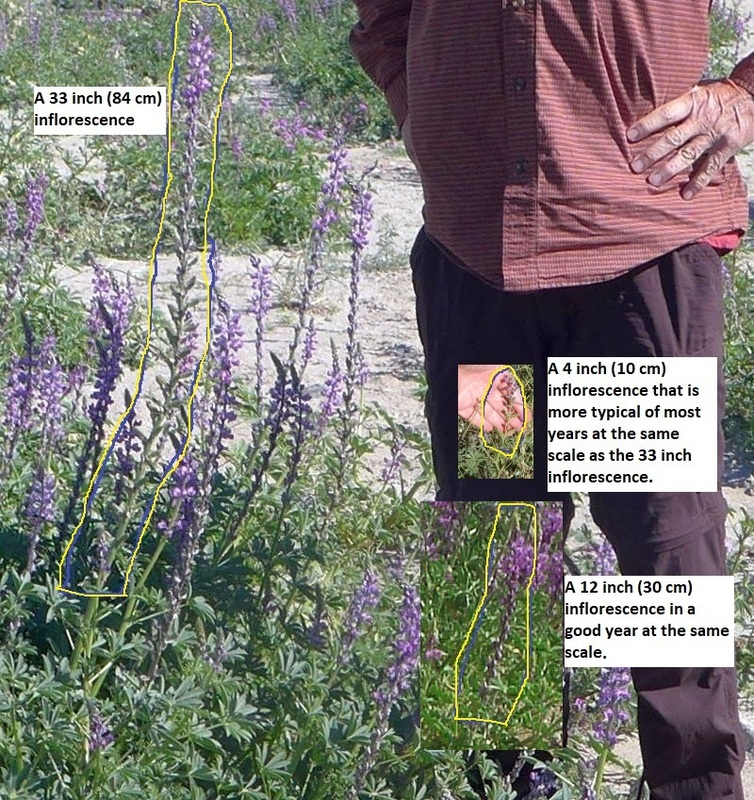 A 33 inch (84 cm) inflorescence, outlined in yellow, measured in the field with a tape measure, with 71.5 inch (182 cm) Don Rideout for scale. The top inset shows a 4 inch (10 cm) inflorescence; the bottom inset shows a 12 inch (30 cm) inflorescence, with their inflorescences outlined in yellow. Click on the picture to see the original picture without labels or insets. I also counted the number of whorls of flowers / fruit on five finished stems, which ranged from 34 whorls to 43 whorls. Each whorl contained ~5 flowers / fruit, so the total number of flowers on the primary inflorescence was roughly 200. As a bonus, I also obtained a rough measure of the growth rate of the inflorescences for their final growth. I measured 13 of the longest inflorescences on 7 February 2019, and 23 of the longest inflorescences on 18 February, 11 days later. The 18 February measurements included all of the inflorescences measured on 7 February, plus additional ones. The mean, median and maximum values of the set of measurements from each day increased by 1.0 to 1.4 inches (2.5 to 3.6 cm) in those 11 days, a growth rate of ~0.1 inches (~0.3 cm) per day.